"I saw the ball bounce off the grass and bounce up into his glove," Mattingly said. "When they showed it on the big screen, we saw it bounce and you just know it's going to get overturned and when it doesn't, it's just frustrating." I see his point, but I also see the point laid out by the officials. Speaking as a fan that has been disappointed more than once while watching an NHL game, it is impossible to get absolute perfection. Furthermore, there is logic to the idea that an overturned call should be based on irrefutable evidence that the play on the field should be overturned. In other words, sometimes a situation is so close and the data/video available so indeterminable that it's only reasonable to say that whatever call was made on the field should stand. 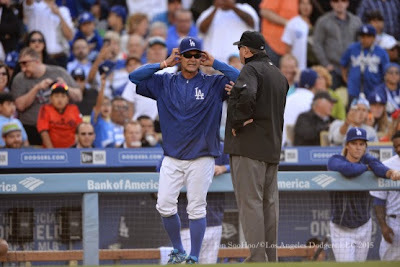 Mattingly's idea of having a so called "blind" jury looking at replays is an interesting one, but I think it's likely unreasonable. In order to speed up the entire process I suspect that there is someone (or more) watching every game in real time. This would allow them to quickly transition from observer to replay official in a moments notice. Not having this in place could mean extending the amount of time it takes to make a decision, and we all know how much everyone hates long wait times. Also, as I said above sometimes video replay just doesn't provide enough information. Overall, I understand why the play was deemed an out. Clearly the ball bounced, but did it bounce on the grass or bounce on the leather brim of the glove? That is something none of the videos provided could show. Via Jeff Sullivan at FanGraphs, "There’s Nothing At All Like the Dodgers’ Offense." Via Mark Saxon at ESPNLosAngeles.com, "Mattingly: Yasiel Puig out at least two weeks." Via Ken Gurnick at MLB.com, "Jansen still LA closer, will be eased back in." "He's going to be the closer -- no question about that," Mattingly said. "We just want to get him comfortable first." Via Ben Reiter at Sports Illustrated, "For ex-Dodgers star Matt Kemp, Padres offer chance at fresh start." Eric Stephen at True Blue LA shares the latest Hyun-Jin Ryu noodle commercial, here. Two Dodger farmhands make Carson Cistulli of FanGraphs, "The Fringe Five: Baseball’s Most Compelling Fringe Prospects." They are Jose DeLeon and Yadir Drake. Baez felt something in pectoral area. MRI tomorrow.